I recently read The Boy in the Striped Pyjamas and liked it, but I didn't feel it fitted my usual format so I thought I'd just write about it. I feel like I'm the last person on earth to read it anyway! I've heard of the book, of course, and the subsequent film, but I'd never picked it up. A friend of mine teaches it to teenagers and really recommends it, so when I came across it in the teen section of my local library last week, I picked it up. The story centres on Bruno, a 9 year old boy living in Berlin in the early 1940s. His dad is high up in the SS and the family gets moved to what we as older readers recogise as a concentration camp (probably Auschwitz) in Poland. Bruno doesn't want to move and is very unhappy as he has no friends at the new house, and his older sister is a Hopeless Case. Out of his bedroom window, Bruno can see a lot of men in striped pyjamas who live in huts, but he doesn't know who they are. His father tells him that they're not people like Bruno and his family are. The family has one of the prisoners, Pavel, helping out in the house, who tells Bruno that he isn't really a waiter, but a doctor. When Bruno hurts himself, Pavel cleans and dresses the wound, but later Bruno's mother tells him that they mustn't tell his dad that Pavel helped him. 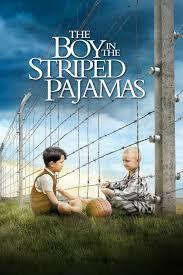 One day, Bruno goes on an Exploration around the edge of the camp and comes across a boy wearing striped pyjamas, sitting cross legged facing the fence. Shmuel is much smaller than Bruno but the two share the same birthday. Bruno and Shmuel meet every day for months, becoming friends even though neither of them really understand why things are as they are. The end of the book is horrifying - but totally right for the novel, and I don't honestly know how I'd have otherwise written it. I liked this quick read and think it's a great book for a young teenager's introduction into the horrors of the Second World War and the death camps.